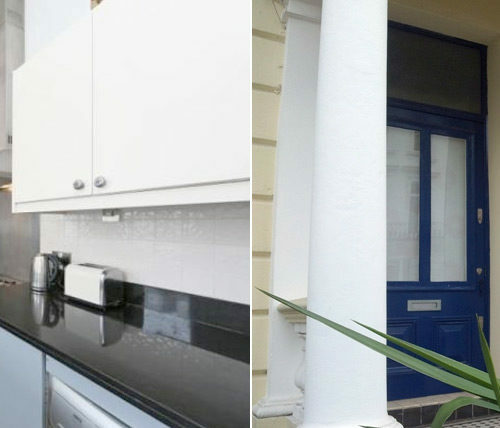 This lovely first floor newly renovated one bedroom apartment is located just one minute walk to Notting Hill tube station in a terrace of classical Victorian villas. Pembridge Gardens is a pretty and quiet residential street featuring traditional period properties, some of which have been converted into hotels but most remain for residential use. Ideal for all areas of London and all the trendy spots in and around Notting Hill. Too many local chic shops, restaurants, cafes and bars to mention as well as a host of great food stores all within walking distance. Kensington Gardens, Hyde Park and Portobello Market are only ten minutes walk away. The apartment which is located is on the first floor (no lift) has been refurbished to a terrific contemporary standard throughout whilst retaining many of the property’s period features. The high ceilings and floor to ceiling windows in the living room give the apartment a feeling of light and space. A great feature of this property is the large balcony overlooking the street with garden furniture provided in the summer months. The comfortable living area has a sofa bed, dining table for two, a large screen digital LG Smart TV and telephone for incoming calls only. Open plan modern kitchen is equipped with washer/dryer, dishwasher, hob, oven and fridge as well as all the standard features (no microwave). Good size bedroom with comfortable double bed and large wardrobe. A marble bathroom with bath and over head shower complete this highly recommended apartment. Prices include all utilities, wireless internet access and a weekly cleaning service. 3rd person is accommodated on the sofa bed in the living area.